Moai are stone statues on Easter Island. Each moai is made out of one large stone but some have an extra stone on top of the head. Most were made from the volcanic rock in the Rano Raraku area of the island. Moai are sometimes called "heads" but they do have shoulders, arms, and a body but these are usually too small for the head, also some of the best known ones had been partly buried over the years and only the heads were showing. Most moai are between 2.5 and 10 metres high and, usually, weigh 14 tonnes. There are about 1000 moai placed mainly around the coast of the island plus nearly 400 more which were left not yet finished at Rano Raraku. Grant McCall (1995). "Rapanui (Easter Island)." Pacific Islands Year Book 17th Edition. Fiji Times. Retrieved August 8, 2005. Thor Heyerdahl, Arne Skjølsvold, and Pavel Pavel The "Walking" Moai of Easter Island. Retrieved August 8, 2005. Kathy Pelta (2001). Rediscovering Easter Island. North Minneapolis, USA:Lerner Publications. ISBN 0822548909. Rupert Matthews (1988). Ancient Mysteries. East Sussex, England:Wayland. ISBN 0531182460. 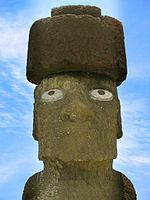 Wikimedia Commons has media related to Easter Island. This page was last changed on 4 February 2019, at 18:39.